When it comes to playing fantasy sports, every advantage counts. For fantasy baseball player Andy Rice– an avid storm chaser and a software product manager for Weather Central, a weather services company (and AMS corporate member) based in Madison, Wisconsin–familiarity with weather data allows him to create statistical analyses of player performance in various weather conditions. For example, as he explains in this interview, major league hitters perform better in hot conditions than in cold, with a league-wide 2009 batting average of .271 when temperatures were in the 80s and .274 when they were in the 90s, compared with just .250 when temps were in the 30s. There are usually somewhere between 25-45 games postponed due to weather out of 2,700 games played per year. That’s 1-2%, so it’s kind of funny when I see people getting so concerned about it in the chat room. 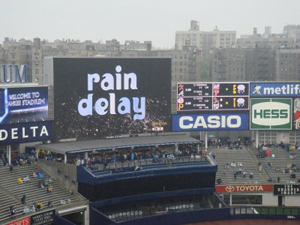 Rain Delays are a different story and happen more frequently. Their impact is mainly on the starting pitcher, since they tend to get pulled after a lengthy delay. In these daily leagues you know that not all of your players are going to have an amazing day, but if your pitcher wins and you get 3 or 4 hitters that have a good day, you have a really good chance of winning. So you need to give yourself a team of batters with an increased probability of having a big day and hope a few hit. If I have two players that I view equally, and one has a chance of steady rain for a few hours during the game, the probability of having a good day goes down and I’ll probably pick the guy playing in the dome.